Radiators are commonplace in modern day homes and allow for fast and efficient heating of all inside rooms and open spaces. Radiators work by drawing heat from the hot water that travels through the radiator to heat the exterior fins which then heats the air around them. When the water supply is unable to flow freely through the radiator itself, it can mean that certain areas of the unit will fail to warm up. Why is my radiator not heating up properly? When the hot water supply cannot flow freely around each radiator, they are likely to feel warm at the bottom but cold at the top. This will dramatically reduce their efficiency and leave your home feeling cold. Usually, radiators that suffer from “cool spots” are suffering from a build up of sludge or air in the radiator unit itself. This is a very common problem in domestic properties, and one that easily be remedied by “bleeding” the radiator. Bleeding your radiators is simple enough if you follow the right safety precautions and be sure that your radiators are completely cool. Begin by turning the heating on and touching the tops of the radiators to identify which ones are not getting hot at the top. When you have made a list of which ones need bleeding, turn the heating off and allow the radiators to cool completely. Most modern radiators require a specially shaped radiator key to bleed them. If you do not have one, you can usually buy one at a DIY store. Ensure you have a cloth or even a small bowl beneath the radiator valve to catch any water and protect your flooring. Hold the key with a cloth and slowly turn anti-clockwise to open the radiator valve. You will hear hissing as the air starts to escape. Once the hissing sound stops and water starts to leak out of the valve, it is time to close it off. Turn the key clockwise to shut the valve. After you have bled all of the radiators, you should check the pressure level on your boiler. If it is below 1.5 bar, re-pressurise the boiler before switching the heating system back on. Your radiators should now all be boiling hot and ready to heat your home. What if bleeding my radiators doesn’t work? 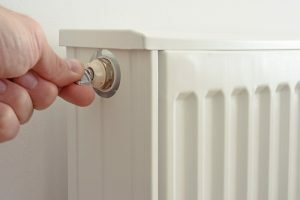 If you have bled the radiators and re-pressurised your boiler but they are still not heating up sufficiently, they may need to be power-flushed instead. Power-flushing is a popular method of cleaning and maintaining a central heating system that should only be undertaken by a qualified and experienced central heating engineer. A specially designed power-flushing unit sends water at high velocity through the system to dislodge and remove debris, limescale, and sludge build-up. This in turn will help to improve the heat distribution once again and will help to keep your household energy bills nice and low. Here at DHS, we regularly attend homes to clear sludge and dirt from our customer’s radiators in the Bristol area, to ensure they always have heating on demand. If your radiators are not working as well as they should be, contact us today. Call DHS on 0117 924 7200, email us or request a call back.